No, not a chuck-up date, this is a Chuck Update. Back in the UK after a week in Scotland drinking Whisky & eating Haggis and a week in Denmark drinking schnapps and eating pickled herring. ’twas the best. Now for the warm beer cold chips. 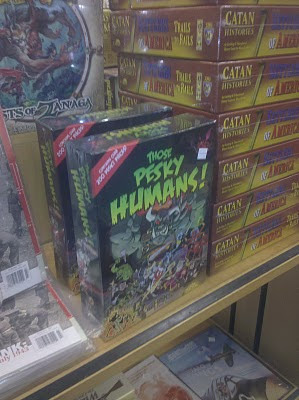 Here’s an exciting image of the first of our games on the shelf at the Source – a huge game store in MN. Legitimacy should be shipping in the next week or so apparently. P.S. I have been playing the game a lot lately with a lot of new and wonderful people. It’s been going really well and I’m seeing that it works very well with all different kinds and numbers of players and am actually starting to believe it could do really well if it finds it’s audience. Darn it, now I can see it, I really want it to happen!! !